Authored by: Syed B. Hussain, Ph.D. Since the Industrial Revolution, capitalism has developed from a practical theory into a major force that has an impact on almost every facet of the global economy. Having been modified and adapted to meet the demands of a changing world, capitalism has proven a resilient and, most would agree, productive economic system. The end of the cold war and the acceptance of capitalistic elements by almost every country in the world—even those that at one time were most antagonistic to capitalism, such as the countries of the former Soviet Union and Eastern Bloc, China, and Cuba—has been taken by some as an indication that capitalism is the supreme economic force in the world today. Encyclopedia of Capitalism, a unique three-volume A-to-Z set, examines all aspects of capitalism, including its history, philosophy, theories, key thinkers, impact on individual countries, and much more. 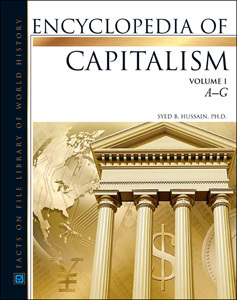 Comprised of approximately 750 authoritative entries dealing with the rise and development of capitalism from Adam Smith to today, the set is edited by a specialist in the area of international economics, and all entries are written by scholars and experts in the field. International in scope and containing comprehensive coverage of subjects, many of which cannot be found in other books on the topic, this work is an essential reference for any student, scholar, or general reader with an interest in politics, economics, or history. The first and only encyclopedic set focusing exclusively on this phenomenon, Encyclopedia of Capitalism provides clearly written definitions, descriptions, and explanations of topics and terms that one is likely to encounter when studying capitalism. With more and more countries participating in capitalist business practices, this work serves as a timely, accessible reference on the subject. Historical events such as the Industrial Revolution, Thirty Years' War, and War of 1812.